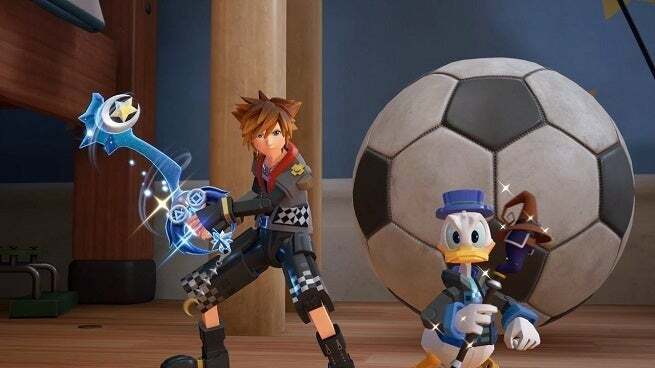 New Kingdom Hearts III videos have been shared by Square Enix which feature the three Keyblades players can receive by pre-ordering the games on different platforms and from different retailers. Whether you’re planning on getting the new Kingdom Hearts game for the PlayStation 4 or the Xbox One, you’ve got at least one exclusive Keyblade waiting for you, but only if you pre-order the game. Those on Sony’s console will get the Midnight Blue Keyblade while Xbox One users will get the Phantom Green weapon, each one of those being reskinned Keyblades which shoot out stars that match the respective consoles’ button layouts. There’s also a third Keyblade which can be acquired that some people might’ve seen previously when Amazon announced that those who pre-order the game through the retailers will get their own exclusive Keyblade. All these weapons can be seen below, but there are more unique Keyblades to be seen here after Square Enix revealed them not long ago. The Phantom Green Keyblade is the weapon Xbox One users have waiting for them when the game releases, that weapon seen in Square Enix’s video above. A reskinned version of the Star Seeker Keyblade, this one shoots out moons, stars, and the green Xbox logo when enemies are struck with it. Next up is the PlayStation 4’s Midnight Blue Keyblade with its blue colors and a “O” and “X” on the pommel to mirror the console’s buttons. Like the Xbox One’s Keyblade, this one shoots out special shapes when hitting enemies, but it uses the PlayStation 4’s entire face button layout instead of a logo accompanied with the stars. Last on the list is the weapon Kingdom Hearts III fans might’ve seen before, the Dawn Till Dusk Keyblade. This is the weapon revealed to be Amazon’s exclusive Keyblade players who pre-order the game will get with that weapon being given out on January 29th. Kingdom Hearts III is scheduled to be released on January 25th first in Japan with a worldwide release coming on January 29th.